How Does Dr. Sells Test for TMJ Syndrome? A review of the patient's past medical and dental history in relation to the TMJ conditions, onset of pain, symptoms and contributing factors. 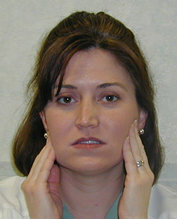 Clinical examinations of the teeth and bite, and of the muscles of the jaw, head, neck, and shoulders to determine areas of tenderness. X-rays of the jaw joints in opened, closed, and rest positions. Casts (models) of the teeth and their chewing patterns. 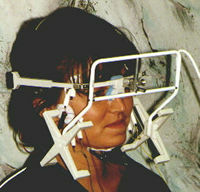 Use of "tens unit" to relax the muscles of the jaw. A "tens unit" is a piece of equipment that uses special pads to supply gentle impulses to the jaw muscles in order to relax the jaw. Analysis of the muscles used for chewing (muscles that move the jaw). Analysis of muscle activity in the jaw and neck. Recording of jaw joint sounds. Results of these procedures help to determine if you have TMJ Syndrome and, if so, how to best treat it.